MUSA ORNATA - BRONZE BANANA. A small banana plant growing up to 9' tall; originally from south-east Asia, also growing in Suriname. Bronze banana has glaucous green leaves, 6' long. The inflorescence is erect, consisting of purple - to lilac bracts with yellow tips. The edible fruits are yellowish when ripe; however the flowers must be pollinated and fertilized for the full development of the fruit. USDA zone 9 A - 11. Partial to full sun; rich moist soil. Needs high humidity. Can be grown indoors in a container. 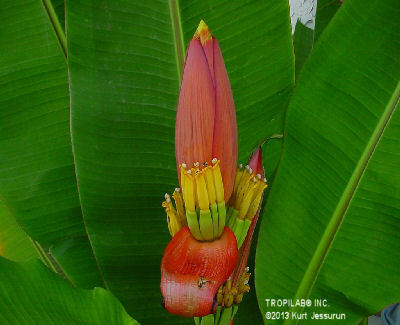 For reasons of pollination, it is best to have more than one bronze banana plant. Can be used in tropical cut flower arrangements.